We pay individual attention to our client’s fitness and wellness goals. No more going to the gym and wandering through a boring workout! Workouts are designed ahead of time so you don’t have to think about anything, just show up and we take care of the rest. We offer group classes where everyone is supportive and motivating. Once you will come in you will make new friends and be excited to come workout. Also If you don’t show up for an extended period of time, expect a phone call or message to see what is going on. We are here to get you healthy! There is nothing better than helping others reach their health and wellness goals. Seeing people get stronger, faster and more athletic while losing weight and gaining muscle keeps us inspired. 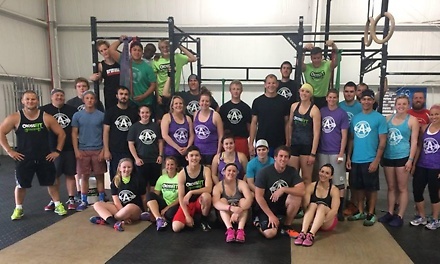 We saw what was missing in a normal gym and with CrossFit we are able to change people’s lives. Watching people do things that they never would have imagined they could do before CrossFit. I love seeing people where they started in their fitness journey and how much they can achieve through hard work and dedication. Also the ability to support mentally and physically our clients. May be repurchased every 180 days. Limit 1 per person, may buy 1 additional as gift. Limit 1 per visit. Valid only for option purchased. Three basic intro CrossFit classes must be completed before attending 1-month unlimited CrossFit classes.